#kenringwatch results for November, December and 2014! Happy New Year! With the old year now over, we can look back at Ken Ring’s final predictions for the winter, his “overall” predictions for the year, and how he did in total. How did Mr Ring do? Regardless of the reasoning, though, that’s definitely a point for Ken. 26. Ah, I love these black or white predictions. The Met Éireann report for November tells us that November was “Typical for the time of year, milder at the start of the month.” That report tells us that the 19th was a perfectly average day for the month – minimum temperatures between 5 and 10 degrees Centigrade, max between 10 and 15. Certainly not subzero. We then got a cold snap and severe winter storm, which Ken didn’t mention. That brought snow – but it didn’t arrive until the 11th, didn’t last long, and only hit a few counties. 28. Ken was correct about no white Christmas, but the lowest temperature recorded over both days at the aforementioned weather stations was 0.8 degrees Centigrade. Predicting no white Christmas is a banker (it very rarely is), but them’s the breaks. Half a point. highest maximum since it opened in 1997. Five degrees higher than predicted – so, zero points. “Overall” category: Zero for two. Total for the year: Seven for twenty-eight. 25% accuracy, exactly. Ken Ring claims 80% to 85% accuracy, but it turns out that when you record his predictions, and check back, then being generous, he’s right one time in four, on average. Half as accurate as a coin-toss. 1) Moon and tides are of no use whatsoever in predicting the weather. 2) Spending €50 plus postage and packing for an almanac that’s right (presumably) one time in four would not appear to be a good investment. “It’s just a bit of harmless fun” is sometimes repeated by reputable journalists as a reason for allowing Ken Ring to use their publication or programme to publicise his almanac. Well, he can’t be done under the Trade Descriptions Act (or else Old Moore’s Almanac would be out of business) – but he is selling his pseudoscience “predictions” at €50 a shot and claims to be selling 1,000 a year. Which would be great if it was accurate, but not when the accuracy is only half as good as a coin-toss. In my opinion, file under crank, snake-oil, or charlatan. If you must invite him on to your show to fill a slow news day, then also invite on a pseudoscience skeptic, or a spokesman from Met Éireann. I suggest Evelyn Cusack. The number of views on here has shot up recently. 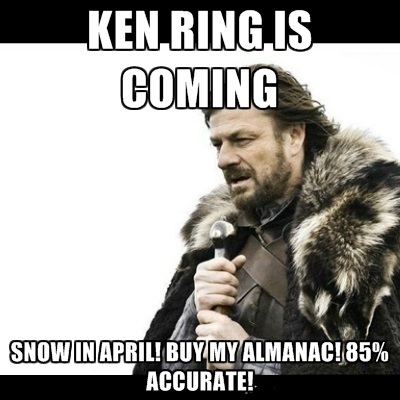 Wondering why, I googled, and yep, Ken Ring has released his “almanac” for next year (at a mere €51 incl. P&P) and the usual suspects published his press releases, with few (or no) questions asked. Which led to more people googling for him, and the happy side effect that many people are finding out the truth about his accuracy, by landing here. Which is good. Interesting question, though – if the moon is the be all and end all when it comes to weather prediction (as claimed by Ring), then why not just release your prediction algorithm into the public domain? After all – we know exactly where the moon is going to be, pretty much forever. So, in the 21st century, why release a paper almanac, once a year, when you could just release an app? Wait… it wouldn’t be all about parting credulous people from their money, would it…? 22. “Monthly rainfall totals were below average everywhere… Low rainfall totals in parts of the South, Southwest and West were due to a period of absolute drought (a period of 15 or more consecutive days with less than 0.2 mm) between the 1st and 21st, with most of these stations reporting their driest September at least 28 years.” So, although it did indeed rain between the 8th and 20th, I think it’d be churlish to not give Ken a mark for this one. 23. A very specific prediction here – a rarity for Ken. Met Éireann: “The month’s highest temperature was 23.9°C at Shannon Airport (on the 4th), its highest since 2004 (10 years)… Highest mean monthly temperature: 15.7°C at Valentia Observatory (its warmest September since 1991).” The handy chart on their monthly report shows that although September was bright and dry, unfortunately, it wasn’t very warm. And it got distinctly cooler in the third week, when Ken thought it’d be getting even warmer. Zero marks. 24. “Sunshine totals were all near or above average with the percentage of average values ranging from 95% at Casement Aerodrome to 144% at Valentia Observatory. Valentia Observatory was the sunniest place, recording over 166 hours of sunshine and its sunniest September since 1972 (42 years). The month’s sunniest day was the 10th at Belmullet with 12.3 hours, it sunniest September day since 1969 (45 years). Number of dull days (days with a high amount of cloud cover recording less than 0.5 hours of sunshine) was up to eight at Casement Aerodrome and Knock Airport.” So, yeah, bright and sunny. Zero marks. Total: 5.5 out of 21. 26% accuracy – the average continues to rise! #kenringwatch results for June, July and August! #kenringwatch is like waiting on a bus – nothing for ages, then three come along at once. Results for June, July and August are finally here – apologies for the delay. In related news, Jamie points out in the comments on the May results post that Ken Ring is actually less accurate than a coin toss. His work is available on the Silly Beliefs website – where an article on Ring’s pseudoscience has resulted in over 550 comments being posted! Those comments are an interesting read… disappearing posts after the fact, other major misses, and failures to predict major events. But then that’s only to be expected. 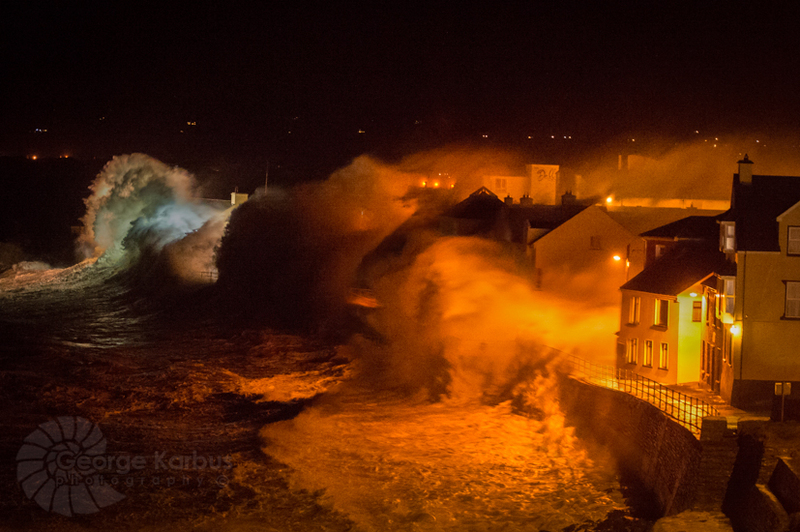 He forgot Christine and her sisters… the most severe storms to hit Ireland in years. Or that his accuracy for 2014’s Irish weather predictions is currently languishing at 20%. 19. Last week of June the hottest. 20. Last week of July the hottest. 22. Lot of wet days interspersed with dry days. So, two easily testable predictions, and one completely vague one. June: “The majority of highest maxima were recorded between the 16th and 18th during the mid-month period of high pressure, with the highest maximum of 27.1°C recorded at Newport, Co. Mayo on the 17th.” Zero marks. July: “Nearly all highest maxima were recorded between the 23rd and 25th, with the month’s highest temperature recorded at Carlow (Oak Park) on the 25th with 27.6°C.” Ooh, close – the 25th is seven days from the end of the month, so one of the hottest days was technically within the last week. Let’s be generous and give half a mark. June, July, August: One and a half for three. Total: Four and a half out of eighteen. We’re up to 25% accuracy! I should have written about the local and European elections. I should have written about the Tuam babies outrage – and the lack of coverage in the traditional media about the issue. I should have written about a lot of things – but I’ve been busy, and lazy, and busy again. Apologies. Must try harder. And instead I find myself writing about Ken Ring again. We last heard from Ken when I posted the April results, where he accused me of lying. He’s not been back yet to retract, or apologise. Oh well. I didn’t lose any sleep over it. He’s back in the news again. Denis O’Brien’s newspaper published an unchallenged puff piece on Tuesday. The predictions listed largely agree with what he’s published or said elsewhere. And apparently Ken “collects regular data from several weather monitoring stations which he has positioned around Ireland.” Selling the old almanacs must be lucrative, so – I just have to rely on the daily data collections published on Met Éireann. The Irish Times followed that up with a piece on Thursday – though as that article talks about a seemingly upcoming appearance on The Saturday Night Show (the season is long over) and Evelyn Cusack’s attack on long range weather prediction quacks, from December, it’s possible the “paper of record” was too busy not writing about the Tuam Babies to come up with a new piece, and just regurgitated something. So Ken – who predicts that 80% of earthquakes take place in 80% of the month – how did we do in May? 98.7 hours at Knock Airport, its dullest on record since the station opened in 1996 to 91% and 173.0 hours at Belmullet. The 14th to 21st was average for the month (i.e., dull) – the last week was the sunniest. Snow on the 30th? Just lol. 3rd week of May the coldest? The chart for max temperatures shows us that the highest temperature in the month occurred in the third week. The first, second, and fourth weeks seem coldest, according to the chart, with the third week being the second-warmest. So, not a good month for Ken. Total: Three out of fifteen. That’s down to 20% accuracy. Your friendly local #kenringwatch correspondent has finally cracked it. Ken Ring? He’s Ned bloody Stark! It’s the only logical explanation. Ken, like Ned Stark, is all about the “Winter is coming!” this year, and has predicted snow for the first five months of the year. Like the doubting Southerners of Westeros, I’ve gone “Pshaw!” and mostly been right. Maybe Ken will be proven right next month. Because unfortunately he didn’t manage it this month, either. On April 19th, we got invaded by Wildlings from north of the wall! Well, north of the Bull Wall. And they weren’t Wildlings, they were Vikings! The 1000th anniversary of the Battle of Clontarf was on Wednesday 23rd, and there was a re-enactment of the battle in St. Anne’s Park in Raheny on April 19th (subzero temperatures). There are some rather awesome photos of the event here and here and especially here! As you can tell from those photos – there was no snow. April 22nd? The week as a whole, including yesterday was sunny, mild, with the odd shower. Or extremely wet and windy, if you were in Cork yesterday. But no snow. Winter is still coming. Overall it’s been a relatively quiet month, weather-wise. 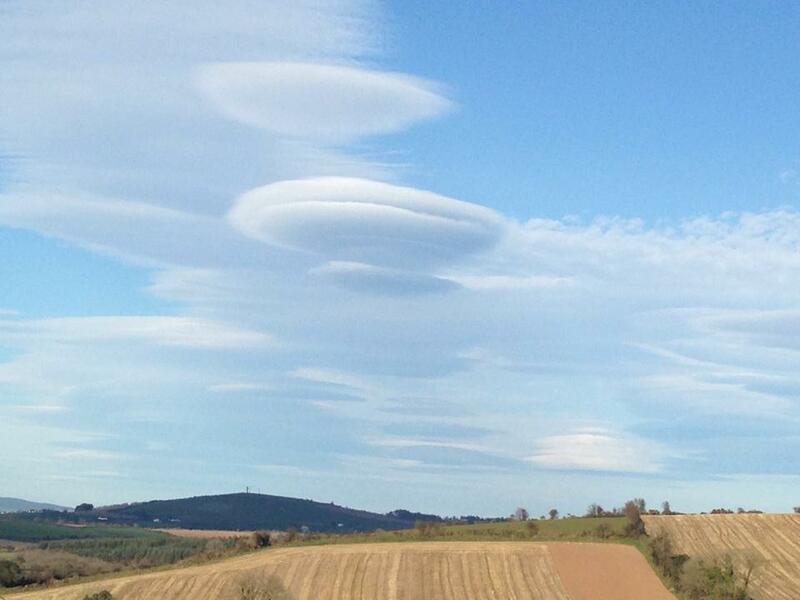 Eircom, up to this week, still had about 4,000 homes still without phone lines after the storms that Ken Ring didn’t predict last month, there was a 2.2 magnitude earthquake that nobody cares about Ken predicting or not, and there were some rather spectacular lenticular clouds. I can find no evidence of snow around the 3rd to 7th March, in the midlands or elsewhere. Misty, foggy, showery, sunny spells – the usual, pretty much – but quite mild for the most part. Yesterday, the 21st March, started out lovely and sunny and got progressively worse. As I drove to Dublin in absolute lashings of rain, bemused at the number of people who don’t think to put on lights while driving in severely reduced visibility, the radio reported sleet in Achill – and snow in Donegal! No snow in the midlands, no snow on the 19th or 20th, but in the comments on earlier posts, Ken complains that I’m taking him too literally and his predictions actually mean possibly a day or two to either side (which is kind of opposite to the purpose of an almanac promising 85% accuracy per day…) – so in deference to Ken, we’ll give him a point for prediction #13. The month still has another day to run, but I’m posting the #kenringwatch results today as a) Ken Ring didn’t predict anything for the 28th, and b) I’m travelling tomorrow and won’t have access to a computer. We had some snow! The Journal reported on snow on the 1st February (although some of that may have been on the 31st January). 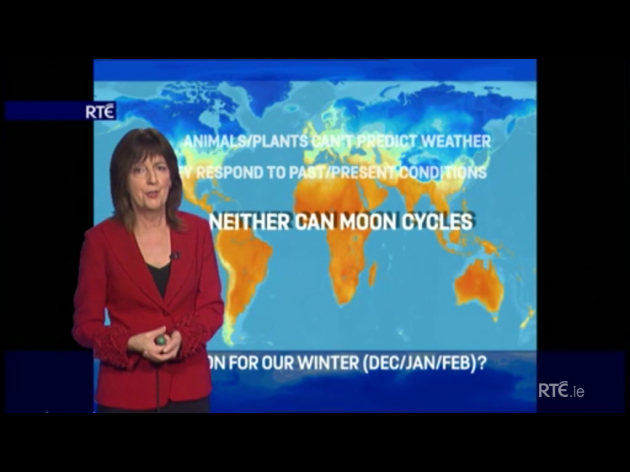 Searching for snow during February, I came across this RTÉ report from the 6th February – but it turns out to be archive footage of 40-year-old snow. There was a smattering of snow on the 11th – but nothing to get excited about. The Indo spotted some snow in Mayo, on the 14th of February, leaving a sub-editor stumped for a snow-related Valentine’s Day headline. I’m now at the bottom of my third page of Google results for “snow in february 2014 ireland”, and as XKCD knows, that’s not a good place to be. Kerry – no snow for you! Technically, Ken has scored on two of his predictions there – numbers 7 and 10. Partially, anyway – snow on the 14th, but not on the 15th to the 19th. Cold, yes, but “bitterly cold”?Not really. The Met Éireann monthly report will tell us if it was anything out of the ordinary, but we’ll give Ken the points anyway. But as we can’t really call this snow intense (and we’re not meant to, according to Ken’s comment on this post), I don’t think we can score him for prediction #9. Total: Two out of nine. So two out of seven, or 28.5%. Well, there’s an “8” and “5” in that number – but it’s no 85%. But y’know, when Ken is on The Last Word or Radio Kerry telling us about the major things we need to know about the weather in the coming year, I’d be ok with him not mentioning the light snow, if he’d instead mention the worst storms Ireland has had this century, that lead to powercuts for over 215,000 people lasting many days, as well as the repeated flooding. 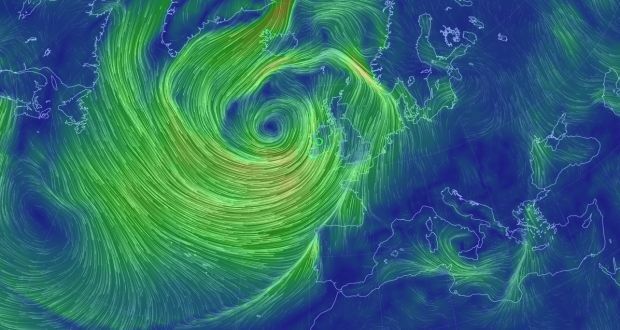 I’d think the people in Kerry might want to know about this storm, rather than a bit of snow, wouldn’t you?